2/12 Tuesday, 75/59, partly cloudy, S10-15 - Our bedding was due for washing, so I attended to that after breakfast. Dobbs continued making adjustments to the bicycle to improve the shifting (he’s striving for perfection) while also keeping an eye out for deliveries to the office that could be our rope. I prepared estimates and communicated with clients about upcoming projects. Lunchtime came and went and still no rope. I spent an hour calling and e-mailing with West Marine Pro customer service, trying to get a lead - what a hassle. It took them until 6pm this evening to assure me we’d have half of what we need tomorrow. The other two ropes will arrive Thursday - perhaps. Stacy, a neighbor from C-dock, came by to ask Dobbs for help with a flat bicycle tire. He coached her through how to remove the tube and patch it, but there must have been more than one leak, or the patch didn’t hold, so he gave her our spare tube. Later, we rode to the hardware store for tools and stopped at Ten Speed Drive to pick up another tube as a spare for Stacy so she has one on hand. She kindly tipped Dobbs $20 for his help. While he was working with Stacy, another lady stopped to ask him if he could check the tire pressure on her bicycle, as her husband was under-the-weather. Dobbs is a jack-of-all-trades and generous with his time and knowledge. I’m fortunate he’s my husband - I can’t imagine a better partner. We did get one delivery today, a surprise from friend and client Jeff, of the Beneteau 210 La Perla Azul - care packages of treats from Trader Joe’s! Blueberry Fig Bars, Banana Coconut Bites, Hippeas (puffed chick pea snacks seasoned with white cheddar, barbeque, or sriracha - think cheese curls that are GOOD for you), packs of nuts and trail mix, and chocolate-goji berry snacks filled the box. Thank you Jeff! It’s been raining off-and-on since two o’clock. We dodged squalls riding to and from the hardware store, but we’ve had two heavy downpours this evening (one ongoing). The air is cooling. 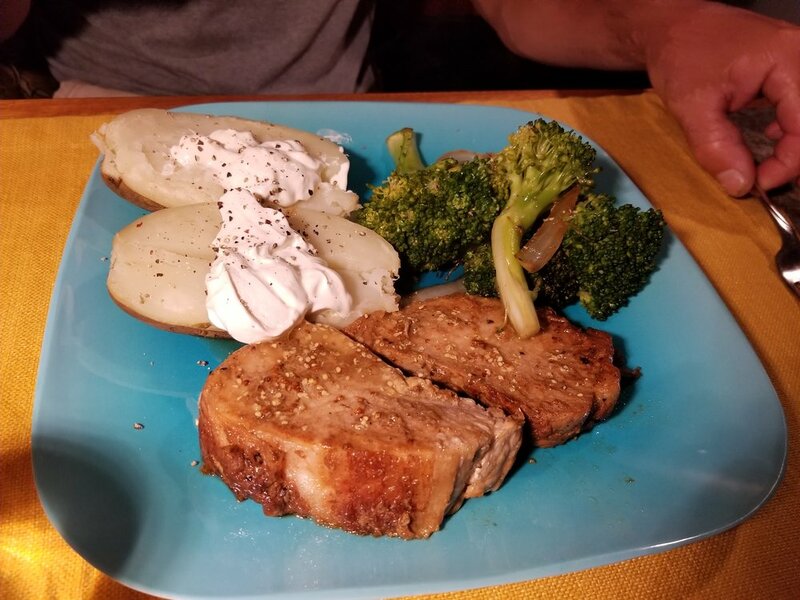 I made a pan-roasted pork loin for dinner, served with roasted broccoli and onions, and dressed with a Dijon vinaigrette; baked potatoes, too. It’s 8:15pm now and Dobbs is up to his forearms in dishes. I’m feeling listless from office work, in need of tennis, yoga, or both.